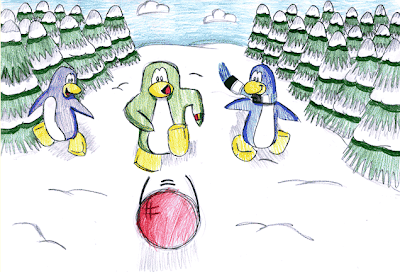 Club Penguin Cheats by Mimo777 Club Penguin Cheats by Mimo777: Club Penguin Art For Haiti Winner! Congratulations to Mickey1216! Excellent job! Play HOT new game, Fancy Pants! Yay! *Claps* Thats the one I voted for. He or she or it did a really good job on it. Awesome! I knew that one would win! Pretty awesome. Not the best of drawers myself. kool! congrats to who won! dat one was my fav. its raining smores and nachos outside! XD OR IS IT ME! I like how everything is so neat and everything is correct and I just love it. I voted for that picture anyways. Terrific work, Mickey1216! Awesome! And i agree, CP should show us the final mural! I voted for this penguin, congrats to him/her. I like how much detail was put into it, it's an awesome picture! I wanted this artwork to win. Congratulations to Mickey1216!! And good work to the top 4 and to everyone that entered!!!!!!! Well done! congrats, mickey! Also, NO NO NO NO NO! the hoodies are coming back! In the news it said that next catalog is all about the hoodies. Pray that they are new ones because my hoodies are some of my rarest items! Well done Micky! That drwing was great! I love that drawing. The penguins and trees are awesomely detailed! Realy good drawing but I wish the soccer one won. I hope so to! i bet it will rock! congrats!!! i liked that one too! yey! i knew it would win!it looks like the artist put alot of work into that picture and now its going to be seen by tons of kids in Haiti! Definitely! Kickball is one of my favorite sports! I just really love that picture! I did too! I like how they colored it! That was really cool! Lol! Neither am I! If I entered one, it wouldn't have come CLOSE to that one! Yeah! That was a really great picture! am not surprised at all that it won! That must be so cool to have your drawing picked! It looks like Mickey spent a LOT of time on it! my stamps dissapeared now theres only pins in the stamp book whats happening? I was wondering the same thing. I made one but I forgot to color cuz I hate coloring online and I can only draw penguins online. kickball is fun,ps.penguin can fly? Yeah, i know! And please please please dont put th words cpg mod next to your name if your not modding for someone! Thx, I'll bet mimo really appreciates that! It's probably a glitchy glitch. Log off and try again. It didnt happen to me. Me too! Kickball is awesome and fun! Hi five buddy! :O! that penguin is one of my friends! Thanks for giving me credit mimo! Also, I agree with a lot of people. Mickey's was the neatest and the most detailed. And the penguins looked perfect! I may have would've gotten in the finalists if I scanned instead of taking a picture of my drawing. And mimo, Disney Create has a new feature! You can make Club Penguin photo mashups, print them, and make posters! I made a few postcards, but I didn't print them out. Welcome! I will keep you informed! Also, check out my stamp walkthrough site! Click my name! That is the one I voted for. I hope to see the real painting soon. Ha ha I was winning the contest for about a minute and now I am almost in last XD. I'm sure that there will be plenty of new ones but also a bunch of old ones. Chalk is FOR DA WIN! Ya CP needs to fix that bug. It happens to a lot of people. The penguin on the left looks like someones pulling on his neck. HAHAHAHAHAHAHA! That's the one I voted for... well there wasn't much competition, this one was by far the best. Are they?! Oh no! Oh yes! I only have a green and a black hoodie and I really want the blue one. But you're also right, I don't want my rare stuff to come back either!! Uh oh! You'd better run! Elmo's got a gun! Big bird's having fun! So you'd better run! Funny song I learnt off my friend. I enjoy the great perspective. It looks like you're in the mural. I know this is a weird post to say this on, but have you ever tried not throwing a snowball at the powerbox on the epf test, and waiting? It works as well. Yes, he does! :) I'm sure they will be happy! Good detail indeed..
Everyone is saying for me not to put CPG Mod next to my name when I'm not modding. Well if you knew the mod rules it says you can also move up places on the list by congratulating the contest winners. I said terrific work, Mickey1216! sheesh! O yh plz come to my b day party on Tuesday the 31st of August 2010 (thats NOT my b day it is a few days after). plz come Byeeeeeeee! Plz plz plz don't send me any postcards coz i don't want u to waste your coins on me... :) thanks if u come. Byeeeeeeeeeee!